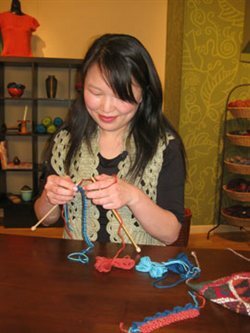 Celebrate the unusually and the unique on this episode of Knitting Daily TV, hosted by editor of Interweave Knits magazine Eunny Jang. Eunny demonstrates an Andean colorwork's scalloped edging. A lot easier to knit than it looks, you can add this unique edging to any design. Eunny is wearing the Mermaid Shrug designed by Kristin Omdahl for the Spring 2012 issue of Interweave Crochet magazine. On this episode's Accessorize Me! 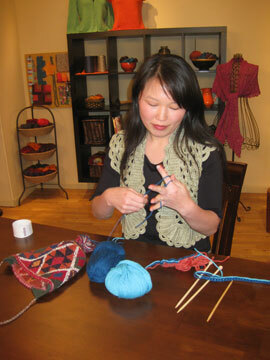 segment, Eunny joins knitwear designer and author Kristen Tendyke with a design from her book Finish Free Knits. The Hope pullover has a unique I-cord element and Kristen will demonstrate how to easily add this to the capped-sleeve pullover or your own design. Knit along with Kristen and download the free pattern for the Hope Top now. Eunny and Clara Parkes surround themselves with luxury on this episode's Yarn Spotlight. Featured is Halcyon yarn's Gemstone Silk Boucle, a beautiful 100% silk yarn that has sheen and luster. Clara and Eunny will discuss silk's characteristics and best uses. Also featured on this yarn spotlight is Windy Valley Muskox's Majestic Blend yarn, made from the soft underbelly coat of the muskox (Qiviut) this fiber is quite delightful for luxurious knitting when blended here with silk and merino. Also seen is Tahki Stacy Charles' Superior yarn (light green). Sponsored by Halcyon Yarn and Windy Valley Muskox. Lastly, Eunny demonstrates a fun technique referred to as purling backwards.